Some time has passed since I began writing the play by play of the trial. We all know how it ends, but people reading this are probably keen to learn all the details. That’s how I am. That’s why I went to the trial in the first place. The “character” Murderer Musings TV Lawyer (MMTVL) is more from the point of view of an analytical jury member asking the questions one might want answered if given the task of deciding a death penalty case. People are curious about the specifics. I’ve had friends ask me about my opinion on the defense put on by Scott Sanders. I’ll give you more of my thoughts on that when we get to the penalty phase of Daniel’s trial. In “Guilty Part Four,” we left off right after the lunch break on December 14, 2015, and Anthony Celeste was on the stand. Anthony filmed each and every performance of the production of Nine, the play Daniel and Rachel were performing in on the days of the murders. Anthony was very familiar with the play. Matt Murphy played the opening scene from each of the shows to see if there were any variations in the performances from night to night. Murphy pointed out that Daniel did a great job onstage and there was no difference in performances even though he had just committed two cold-blooded murders. Anthony also answered questions about Rachel Buffett’s performance that night. He noted that, unlike her other performances, Rachel shed actual tears during her crying scene that night.. It wasn’t like her to be able to cry on cue. MMTVL doesn’t really have any questions, but I want to say that Anthony Celeste did fine work filming the show. It looked great. And the stuff about crying on cue was pretty funny, but in Rachel’s defense, it is not easy to do that. Michael Cohen was one of the Costa Mesa Police Department officers who interviewed Daniel and eventually took his confession. It was during Cohen’s testimony that Matt Murphy showed the jury segments of the video of Daniel’s interrogation. The time stamp on the video showed that this was an edited version of the questioning. Who knows what was left out or why? But we saw Daniel change his story repeatedly before he gave his confession… and don’t think the detectives didn’t notice the discrepancies. Some of you may have seen snippets of the video on the Dateline episode. Just so you know, I have made fun of him repeatedly for the Tommy Bahama shirt he wore. He was arrested at his bachelor party. I feel like this wasn’t a classy event. The police brought Daniel in because they connected him to Sam Herr’s ATM card through Wesley. They are searching for Sam at this point: They still think he murdered Julie and is on the run. They even thought they might find Sam at the bachelor party. Early on, Daniel owned up to being involved with Sam in a plan to defraud Sam’s bank. Sam gave Daniel his ATM card and PIN. Daniel would arrange for money to be taken out of Sam’s account. Sam would claim that he didn’t take the money out, and the bank would replace the “stolen” money. That was it. Daniel didn’t know where to find Sam. He didn’t know anything about Julie’s murder. He admitted that he lied to the police (that happens a lot on the video). He knew more than he originally told them. Sam had come to Daniel and Rachel’s apartment early Saturday morning. Sam was “freaked out” and told Daniel that there was a body in his apartment. He’d shot Julie the night before during a drug and alcohol fueled fit of rage. He needed help getting away. He asked Daniel to take his laptop and get rid of it. Daniel dropped Sam off in Long Beach on Saturday afternoon. He didn’t know anything about the murder weapon. He hadn’t even seen it. The CMPD wanted to know why Daniel agreed to help a murderer escape. Daniel claimed he was afraid for his and Rachel’s safety. Sam had threatened to kill them both if Daniel didn’t help him. In return for helping Sam get away, Daniel would take all of Sam’s money out of his bank account. Some of the money would get to Sam. Daniel would keep the rest. He insisted that Rachel didn’t know anything about any of it. The CMPD wanted to know how Daniel was going to get the money to Sam. Now Daniel acknowledged that Sam had purchased a burner phone. Sam would eventually call Daniel with information on how to get him money. The police ask Daniel for a DNA sample to “eliminate” him. He obliged, but remembered that he had been in Sam’s apartment on Friday night. He had used the bathroom. At this point, Daniel agreed to tell the officers everything ; anything he could do to get out of jail for his wedding that Friday. The officers were not buying Daniel’s story. He wasn’t going anywhere. He was being charged as an accessory to murder. Daniel was in a lot of trouble. The police suggested he cooperate. Tell them everything. Lead them to Sam. That would look better for him in court. He should “man up.” The officers asked him what they should tell his fiancée. “Tell her I’m sorry,” he quietly mumbled. Things continued to get worse for Daniel. The police tried a perfectly legal but dishonest tactic. They told Daniel about finding his DNA at Julie’s crime scene. Sam had taken Daniel up to his apartment and Daniel had seen “the goddamned body.” He said he saw the bullet holes in Julie’s head. Things really unraveled for Daniel after that. Officers said that seasoned detectives weren’t able to see the bullet holes because of Julie’s position and her hair. Daniel tried to talk his way out of this error by saying Sam had told him that there were two shots. This didn’t work. Now they were sure that Daniel was part of this murder. Maybe he even shot Julie. They tried to convince Daniel to “let it go” and that he would “feel much better,” once he told them the truth. Daniel wanted to talk to Rachel. That is where Judge Conley ended for the day. When I went to hearings for Daniel’s case in the past, I’d park in the same structure as when I visit the jail. It’s about a ten minute walk to the Santa Ana Superior Courthouse. On my route, I pass a little homeless camp; a very polite and unobtrusive group of people. I like going the “back way” because then my impatient self doesn’t have to maneuver around all the (rightfully unenthusiastic) jurors on the Civic Center Drive sidewalk. Everything was as per usual on Wednesday, December 9th… that is, until I walked past a row of news vans on the way. I was pretty sure they were there for the same reason I was. That was the opening day of Daniel’s trial: the guilt phase. The penalty phase comes after the guilt phase. The interesting thing I’ve noticed is, in court hearings, the penalty phase is discussed as though it’s inevitable. It is never called the possible penalty phase. I wonder if that is the norm? Is is always assumed the defendant will be found guilty, and that a penalty phase will be necessary? There was an unusually long line to get through the metal detectors at the front entrance of the courthouse. I hadn’t seen it snake out the door before. Inside, it took the elevators an inordinate amount of time to make their way to the first floor. I made jokes with strangers about placing bets on which elevator would arrive first. As soon as one arrived, I shoved myself in and let the claustrophobia attack begin. 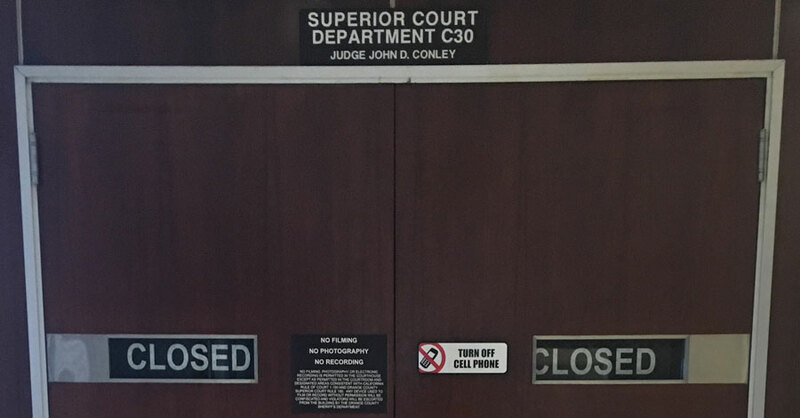 Courtroom 30 is on the eighth floor. I’d been there before, and usually had my pick of where to sit. I wasn’t at all prepared for the crowd I found when I opened one of the double doors. The place was packed. I chided myself for not realizing this would be the case. Duh! It is the biggest court case in Orange County this year. At least that’s what an OC Register reporter later told me. Seats were saved with coats and purses. People milled around in the aisles. Discussions happened in little groups. Photographers and a TV camera were set up in the front by the jury box. I was hoping to sit where Daniel might catch a glimpse of me. Maybe I could be a friendly face in the crowd. He’d told me I should sit “stage right / audience left,” so there was a possibility he could see me when he looked at his lawyer. I was lucky to even find a seat near the back. I made a note to ask Daniel why the row directly behind the defense table was blocked off with two heavy black chairs. Later, he told me he wasn’t sure, but thought it might be to keep an empty pathway in case the crowd needed an emergency exit. I’m not sure why, but I was surprised to see all the lawyers “on stage” already. Coming from the world of the theatre, I kind of expected a dramatic entrance. I wanted to see Matt Murphy and Scott Sanders coming in with a big musical number. It would have been apropos, if you ask me. I wonder if either of them knows how to tap dance. It wasn’t until the bailiffs brought Daniel into the courtroom that the mood shifted. This was probably the first time a lot of these people had ever seen him in person. Does he look dangerous to other people? He was wearing gray slacks and a blue pinstripe shirt. His hair and beard looked neatly combed and trimmed. I asked him about it later, and he agreed: it was nice to wear street clothes. They sat Daniel in his usual spot at the defense table and took off his handcuffs. I got the feeling he was trying to look as blank-faced as possible. He’s a naturally “smiley” guy, so that’s probably a challenge for him. I can’t imagine being under the scrutiny he’s experiencing. There is no facial expression he can make that will not be judged harshly. No nod or finger tap is safe. The bailiffs prefer he just sit still and face the front wall. This is limiting, but probably the best choice. Directly across from the jury box was a large built-in projector screen that comes down from the ceiling. It felt ominous in spite of the “beach scene with surfer” screen saver. You know we were all wondering what they were going to show up there. I was excited to get a look at the jury as they were brought in. Daniel had said they were a diverse mix of people when we talked on the telephone the night before. He was right. Males, females, different races and ages. It was an impressive variety, especially for Orange County. Judge Conley started everything off by giving very thorough jury instructions. He had a slight sing-song quality to his voice, like when you’re explaining something complicated to a group of extremely intelligent children: You know they are smart enough to understand what you’re saying, but you still want to be as simple and clear as possible. Then, we were off and running. District Attorney Matt Murphy was up first with the prosecution’s opening remarks. This was the first time I’d had trouble hearing his voice in court. He seemed to be speaking only for the jury. Quiet and intimate. People around me complained that he needed to be mic’ed, but I think he was forcing us all to listen hard. For the next two hours, he gave us an intimidating list of coming attractions as he laid out his case against Daniel Wozniak. I already knew the main story of this crime. Daniel is accused of murdering his neighbor, Samuel Herr, on May 21, 2010, and then drain Sam’s bank account. He is also accused of killing Sam’s friend and tutor, Julie Kibuishi, in Sam’s apartment, on May 22, 2010. This was allegedly an attempt to frame Sam for Julie’s death. Daniel is also accused of dismembering Sam’s body and discarding the parts in a park. During Murphy’s opening remarks, he talked about a number of aspects of the case that I hadn’t heard before. A backpack filled with Sam Herr’s belongings was found in the yard of Daniel’s parents’ next door neighbors. The police are in possession of the gun that was used to kill both Sam and Julie. It’s registered to Daniel’s father. It was turned in to the Long Beach Police by a friend of Daniel’s brother, Tim (who is also facing accessory charges). Daniel told the young man who actually withdrew money from Sam’s account to wear a hat and sunglasses. A mysterious drawing was found in Sam’s apartment. Murphy pointed out that it looked like an Asian woman on a bed with flames drawn around her head. A wedding invitation for Daniel and Rachel’s wedding was also found in Sam’s apartment. The police think that there are handwriting comparisons between the writing on the envelope for the invitation and the writing on Julie’s clothing when she was found dead in Sam’s apartment. Julie sometimes spent the night at Sam’s apartment, but Murphy adamantly claimed that the relationship was purely platonic. Some pretty incriminating Internet searches were found on a computer that had been in Daniel and Rachel’s possession. There is a recording of a phone call that Daniel made to Rachel from jail after his arrest. Murphy said that it implicates both of them in the crime. So much of this was new to me. Some of it was new to Daniel, as well. The defense chose to waive its right to an opening argument at this time. Daniel told me that Scott Sanders has never done this before. It all looks pretty bad for Daniel if Matt Murphy can prove everything he says happened. So, how do I feel about all this evidence against my friend? Well, so far this is all the prosecution’s story, and I want to see it proven. I’m going to attempt a sports metaphor here. Let’s say you have a favorite football team. It’s your home team, but they have a terrible record. You’re watching a game between your team and the highest ranked team in the league. You really don’t expect your team to win. The odds are against them. The stats look terrible before they even got on the field. Still, you’d like to see a different ending. But if your team doesn’t deserve to win… maybe they don’t practice, maybe they cheat, maybe they tried to give the other team’s star quarterback food poisoning….you will know in your heart they deserve to lose, but you will still support your team. Next week – The witnesses for the prosecution. Update: Both prosecution and defense rested on December 15. Prosecution finished with its witnesses. Defense didn’t call any. I have a lot to catch you up on readers! I’ll admit it. The majority of what I write about Daniel does have a tendency to show his “decent side.” I don’t do that to sway anyone’s opinions about him. I’m just writing about my own personal interactions. That doesn’t mean that I’m blind to his possible dark side. It’s not a side I personally see, but I’m cautiously aware that it may exist. I probably even unconsciously look for it. Normally I don’t go searching for faults in my friends. Most of us let the negative things slide when we like someone. Unfortunately, I can’t just see Daniel as a regular guy. There are aspects of his personality that I’d likely ignore in one of my “free friends,” but Daniel doesn’t get the benefit of the doubt for anything, does he? He’s cocky: Orange County theatre is rife with cocky actors, but it bothers me when Daniel lets the world see this side of him—especially in court! The man cheerfully bounces into the courtroom. He even sometimes smirks or scoffs at some of the proceedings. Keep in mind that there are plenty of laughable comments being made, but he’s not allowed to react to them. I’m guessing he believes that people will hate him no matter how he behaves. I still think it makes a difference. He’s vague: OK, I can’t actually hold that one against him. There is no blogger/blogee privilege. Still, it’s nerve-wracking to converse with someone who has to be so careful about everything he says. It limits a person’s abilities to trust and connect. He can appear to be insensitive: Whether he’s guilty or not, he should respect the pain felt by the victims’ families. He doesn’t come off as empathetic, even though I think he is very much so. This case has been going on for over five years now, and Daniel is being scrutinized… constantly… by everyone. Maybe he’s just become numb to it all, but I don’t think the victims’ families would accept that as a reason for not showing sympathy. His favorite band is The Dan Band: Yeah… his taste in music is limited to say the least. Also, he does like that his name is in the band’s name. ‘Nuff said. He sometimes has that “smartest guy in the room” attitude: I will acknowledge that he is very smart. Of course, it wouldn’t be difficult to feel like a Mensa member where he’s living. He has learned a tremendous amount about the law during his incarceration and in another life, he might have made a great lawyer. But I worry that he might underestimate people sometimes. He has a lot of confidence in himself, but I’m not sure how he’s going to fare when dealing with the Orange County DA’s office. He may have killed two people: I am not taking this lightly. The Daniel I know is a good guy. He’s kind and generous. He’s smart, funny, and an interesting conversationalist. I like that guy. But I don’t ever forget that he might be an actual murderer. I’m not talking about an accident… this isn’t just a bar fight gone horribly wrong. Daniel is accused of some sickening and inhuman acts. Did he kill a war veteran? Did he decapitate and dismember his body? Did he murder a completely unsuspecting and innocent young woman in order to frame the other victim? Did he do all these things just to steal money for a fancy wedding? I sure hope not. The questions are never far from my mind and sometimes I even feel a little guilty about that. I’m sure there will be some readers who ask me why I even bother. No one is forcing me to have this relationship OR to write about it. But he’s interesting and obviously I like a lot about him too. It wasn’t in my original plan to have genuine friendship with Daniel, but I do now. And blog or no blog – that won’t change. On Friday, August 14, Daniel Wozniak went to court, again. I had planned to be there. I prepared in advance to be there. Nothing specific happened to interfere with me being there. So why wasn’t I there? That’s a good question. That’s what I kept asking myself as I dilly-dallied around my house until it was too late to go. I was mad about it. Mad at myself. And the self-bashing escalated when I found out that Steve Herr, the father of murder victim Samuel Herr, spoke in court that day. My understanding is that he essentially asked the judge to get on with it. Rightfully so. His son was murdered five years ago, as was Sam’s friend, Julie Kibuishi, whom Mr. Herr was the first to find. There are some people (quite passionate writers, I might add) who have suggested that, because I am admittedly Daniel Wozniak’s friend, I am completely oblivious to the feelings of the victims’ families. That’s not true. However: do I know what they are going through? Of course not. It would be ridiculous for me, or anyone not in their unenviable shoes, to comprehend their pain. So I had a chance to personally hear Steve Herr speak in court, and I missed it. It was the opportunity to listen to this grieving father’s own words. I am writing a blog about my friendship with his son’s accused murderer. How can I be an honest writer without acknowledging his pain? One might ask why I haven’t tried to communicate with the Herr and Kibuishi families. I want to tell a balanced story and show both sides, right? Of course. However, I suspect that, at this moment, they have enough on their plates to bother with a blogger who is just fleshing out a possible-someday-maybe book. I definitely plan on approaching the loved ones of Sam and Julie in the future. If any relatives or friends of the victims agree to speak with me, I will be honored. Back to court though: You might be wondering if I was afraid to see Mr. Herr speak. Would hearing the pain in his voice make it difficult to rationalize being friends with Daniel? Nope. It’s quite the opposite, actually. I didn’t know he was going to speak that day. Had I known, I would have mustered my courage and made it to court. I want to be reminded of the victims and how there lives and Daniel’s will forever be intertwined. Steven Herr was not the reason I avoided court. I think I didn’t go because I hadn’t sifted out the answers to some legitimate questions. Yet. For the past couple of weeks, a number of people posted comments on this site’s Facebook page making accusations and assumptions about my motivation for writing this blog. Some commenters were quite vocal about their dislike of this blog, and of me for writing it. Fans of mine or not, some valid questions were raised amidst the insults . Why did you write to this murderer, especially since you hardly knew him before this all happened? Are you trying to get famous? What kind of sick person would be interested in a murderer in the first place? Why have you chosen his side instead of keeping an open mind? Are you being played and manipulated by a murdering sociopath? I had my own internal answers for all of these questions, but I didn’t feel like I had a way of verbalizing them. No, I didn’t think that. But I did start to wonder, “What if the bailiff or the court reporter happens to ask you who you are, or why you’re there?” Hence, this post topic. I didn’t want to miss court again. Let’s start with why I wrote to a “murderer” in the first place. As I’ve said in other posts, I’ve had a fervent interest in the topic of True Crime since long before I’d ever even heard the name Daniel Wozniak. I’m a admitted True Crime junkie. I think it’s hereditary! My biological mother is the same way. My seventeen year old watches everything from Dateline to Homicide Hunter with me. We call it “watching crime” in my house. The genre might not be for everyone, but you can’t deny it’s popularity. If I am sick for having this interest, well, I’m not alone. I can remember watching the TV movie Helter Skelter in 1976. It’s based on the novel of the same name by Vincent Bugliosi, about the investigation and trial of the Tate-LaBianca murders that were orchestrated and directed by Charles Manson. Side note: On Facebook, I was accused of being a “Manson girl.” For the record, that comparison is not entirely accurate, since it was actually the “Manson Girls” (Leslie Van Houten, Susan Atkins, Patricia Krenwinkel and Linda Kasabian), and two male followers of Manson, who committed the murders. I am just writing about a murder case. I didn’t murder anyone. In 1986, I was glued to the two-part TV movie series The Deliberate Stranger, starring Mark Harmon as convicted serial killer Ted Bundy. I wasn’t the only one tuning in to get a glimpse into the mind a psychopath. Like many, I was fascinated by Bundy. How could this seemingly intelligent, charming man commit numerous horrific murders? More important – why? When I’m directing plays, I ask “why.” Why do characters act the way they do? Working on a modernized version of the Greek tragedy Medea (the story of a woman who murders her own children), I spent months researching women like Susan Smith and Andrea Yates. It wasn’t enough to just tell the story. I wanted to show the human being behind the story. The audience wasn’t necessarily going to like Medea, but I was going to make them think about her. I was still working regularly at the Hunger Artists Theatre Company in 2010 when Sam Herr and Julie Kibuishi were murdered. Like everyone else, I believed exactly what the newspapers said about Daniel Wozniak being the savage murderer of these two innocent victims. Since I had actually just met Daniel Wozniak, spent time with him, joked with him, asked him to audition for my play… well, I won’t deny it: I was enthralled. I wanted to understand why! Even though my public creative focus was on directing, I’ve always liked writing as well. The thing is, you don’t always have the time to do everything you want to do. Hunger Artists eventually closed its doors. My kids got bigger and more independent. I found myself with time to write, and so, I did. I wrote about my life. I wrote about Mary Magdalen. I wrote about anything I found interesting. A guy I’d met four years earlier was accused of and had confessed to double murder, and yet he still hadn’t been sentenced. That, I found very interesting! I realized maybe I could write a true crime book. It was close friends who kept telling me that it would be more interesting to write about my own involvement with Daniel. Anyone could report, but I had a connection. Did I think this would lead to me becoming the JK Rowling of the genre? No. Did I hope that other people would be want to read what I write? Of course. Just like I wanted people to see the plays I directed. That is why I wrote the first letter to Daniel and hoped that our brief meeting years earlier would be enough to entice him to write me back. The purpose of the blog was to have a place to write, and think, and question, and prepare, for a possible future book. The thing is, I already assumed Daniel Wozniak was completely guilty. The police and the newspapers said he confessed. There. Done. So let’s see if I could find out what kind of person would do these horrible acts? I am not proud of determining anyone’s guilt solely from what I’d read in the paper. That wasn’t fair. Innocent until proven guilty, I kept telling myself. Was I a witness to this crime. No. Have I ever read or heard a recording of the confession? No. Do I have any information about physical evidence? No. Have I seen pictures of the crime scenes? No. That’s not the kind of person I am. I don’t blindly accept without proof, but that’s what I was doing, and I was going to stop. Like the judge in Miracle on 34th Street, I was going to wait and see. Keep an open mind. That is what I’m doing. Do I think Daniel is a completely innocent man who is unfairly incarcerated? No. I’m guessing that he had something to do with… something. That’s my hunch, but I do not know if he is a murderer. The trial will hopefully answer some of those questions. Does having questions mean I’m being manipulated by Daniel Wozniak? I don’t think my blog accomplishes anything for him, although he does like the idea of it. Not that he has any way to read it. Maybe he’s a narcissist. He might just like that someone isn’t calling him a monster, for once. Here is the part where some of you are going to get cranky. I don’t think he is a monster… at least, I don’t think that of the person I now know. I like Daniel. He writes a great letter. He makes me laugh. He tells the cheesiest jokes. We talk about life, religion, politics and cartoons. I enjoy our conversations on the phone, and I like visiting him. I’m not alone in that. Daniel has close friends and supporters in and out of jail. There are even those who believe he’s not a murderer. And hey… what if he isn’t? Posted on August 26, 2015 January 17, 2016 Tags daniel patrick wozniak, personal2 Comments on Fear and Loathing of…Me? I asked Daniel a lot of questions in my early letters. I was super curious about his day to day living. I’d stick to asking basic stuff. Our correspondences are obviously not private and he still hasn’t had a trial, so what is the point in asking questions he can’t answer? I wasn’t sure how he’d feel about me “interviewing” him, but clearly, that is what I was doing. Did you study art at all? I loved the card you made me and I was ridiculously impressed by your skill. I’m limited to stick figures myself, ha ha. What does your cell look like? Do you always have a “celly?” (Yeah that’s right. I’m learning the lingo). I’m reading the biography of Damien Echols (West Memphis Three) right now. One thing that struck me was his feelings of anger and hatred toward the guards. He says “it’s the guards and not the other prisoners that make being incarcerated so much harder…” So, your take on this? This might sound silly, but have you considered starting some kind of theatre group behind bars? Performance therapy? You might be laughing at my prison naivety right now. Maybe you could entertain the masses with Shakespearean monologues?? So why were you reconnecting with your parents? Was it your drug use that caused a rift between you? Do you think she (his now ex-fiancee) ended your relationship out of anger or fear because of the charges she’s facing herself? Did you have a big wedding planned? OK, here’s a big question. I’m not sure if you can even answer this one. You seem like it bothers you that people would believe you were motivated by money… You don’t want people to think you had major financial troubles. The thing is, Daniel, to me it seems like society would consider it a lesser evil to believe that a person might do certain things when facing a desperate financial situation. If you didn’t have money problems then what would you want people to believe motivated you? Is your lawyer a public defender? You said you were visited a couple times by one of your victims’ dads. HE had written in his letter “one of my victims,” so I was just going with his terminology. Which dad? Has he explained his motivation for wanting to visit you? I have to ask you how you are handling the possibility of getting the death penalty. Are you afraid of this? The rest of my letter was answering his questions about me. I called it a fair exchange of information. No, I don’t consider myself to be a religious person. I told him about my adopted dad — who passed away 8 years ago — and that I loved him tremendously in spite of his unchecked alcoholism. I shared that I now have good relationships with both my biological parents (I just found my biological father last year). That I was reading the second Game of Thrones book (I didn’t want him to think that when it comes to reading materials, I’m all crime all the time). Oh, and I also included a copy of a good review he got when he was acting in the play “Nine” (his last performance before the arrest). I finished my letter by asking if I could maybe visit him at some point…I signed the letter with “your friend,” and I meant it. It’s time to name names.Daniel Patrick Wozniak, for example. Go ahead, Google it, I’ll wait. That’s right folks. Bye bye pseudonym! This blog is about to change. As I told you in my last post, I’ve been having an “existential crisis” because Pat didn’t know I was writing a blog about our relationship. And the only way to stop stressing was to just tell him about it. This made me nervous, but I couldn’t say exactly why. It wasn’t like I was afraid he’d be angry at me. My concern was that he’d feel I had violated his trust. It’s probably weird to most people, but Daniel has become a good friend in the past eight months and keeping this from him bothered me. I hadn’t used his real name, but it wouldn’t take a cyber genius to connect the dots from the description of the crime. On Friday May 22, I visited him at the Orange County Jail in Santa Ana and I told him.His reaction floored me. Instead of being upset or even concerned, he seemed amused. This seemed like a foolish question on his part. Yes, OK, that statement is rather ridiculous considering where I’m visiting him. Basically, he said that there’s already a ton of stuff written about him and most of it’s bad, so go ahead and use his real name. I’m guessing he thinks what I write will be all good stuff.